Though we don’t get the sheer volume of Snow Geese (Chen caerulescens) that one might find in more westerly regions of North America we here in New York are often blessed with decently-sized flocks of the marvelous white geese with black wing tips. They are a welcome departure from the wildly honking Canada Geese and the diminutive Brant, both of which winter in much larger numbers in the city. Jamaica Bay is the most likely place to see Snow Geese in the New York City area and this past Sunday was no exception. Patrick of The Hawk Owl’s Nest and I met at Jamaica Bay early in the morning and walked around the mostly-frozen West Pond, spotting many species of waterfowl but none were as compelling as the Snow Geese. In the second picture above the lower bird is a first-year bird, easily identified by the dark trailing edge of the wings. Of course, the “blue” form of the Snow Goose would also show a dark edge, but the rest ofthe bird, except for the head, would be mostly dark as well. While we saw quite a few species at Jamaica Bay I don’t think either one of us appreciated any other species as much as we did the Snow Geese, which all by themselves made the early morning in the cold worthwhile. We might have changed our minds, however, had the taking of the picture below ended up like I was kind of scared it might…fortunately, Snow Geese don’t poop on the wing (at least not so far as I know). This post has been submitted to Bird Photography Weekly #14. Go check it out! Gorgeous pics, Corey. Such cool birds. Makes me think about Paul Gallico’s The Snow Goose. @Kyle and Liza Lee: Thanks! And, Liza Lee, you made me google Paul Gallico…I might have to pick up a copy of The Snow Goose now! 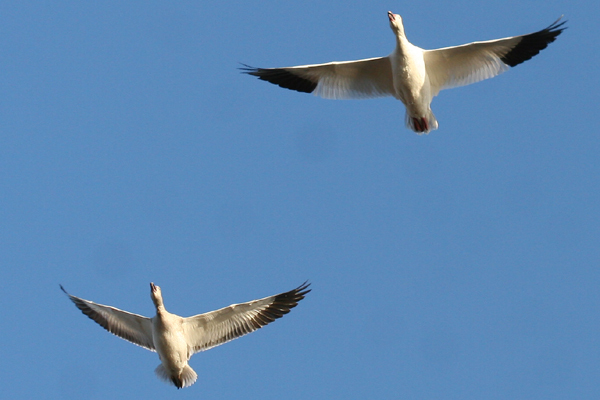 Snow Geese in flight, en masse, is one of the greatest things I’ve seen in my life. Thanks for the memory and great pictures. Beautiful photos. When I saw the mass of snow geese in flight at Bosque del Apache several years ago, I was so thrilled. There is nothing like being in the midst of them when they take flight and hearing their calls. Great individual shots. @Sparverius: Thanks and I agree totally! @Vickie: Someday I hope to get to Bosque del Apache myself…someday! What a wonderful experience to have them flying over head like that! Glad you braved the cold so we could see these. Wonderful photo, Corey! I have yet see this kind of spectacle in person. Thanks for sharing.